Gastric bypass surgery is the most common of the surgical weight loss procedures performed. For this procedure the stomach is cut at the top leaving a small pouch that is able to hold about one ounce of fluid unstretched. A section of the small intestines about 50 cm down the road is brought up and connected to the pouch. This section is called the Roux limb (named after Dr. Roux who invented the surgery). This is now the part of the stomach and small intestines the food goes down. The remainder of the stomach and early part of the small intestine creates a blind pouch that is then connected to a section of the small intestines downstream. This is called the Y limb because it creates a ‘Y’ shape. The Y limb allows stomach and intestinal juices and bile to be deposited in the small intestine and aid with digestion. The new anatomy creates something called ‘dumping physiology’. This is an unpleasant constellation of symptoms including lightheadedness, nausea, sweating, abdominal pain, and diarrhea that occur after eating a high sugar meal. These symptoms act to counteract all the psychological impulses that lead to overeating. If you got really sick every time you ate too much, it wouldn’t take long for you to be less of a big eater. These symptoms also have an impact on the addictive characteristics of eating. The high of the eating will be offset by the sick feeling afterwards. There is less of the small intestine involved in digestion creating a state where less of the calories eaten are absorbed into the blood. It creates a forced malnourished state. Ghrelin (an appetite stimulating hormone) and peptide YY (a satiety stimulating hormone) are secreted in the part of the GI tract that is affected by the surgery. This results in decreased levels of ghrelin and increased levels of peptide YY. The end result is that bypassing this part of the stomach appears to alter the hormonal influences of appetite and satiety in a way that will decrease calorie intake. Based on the above mechanisms, it isn’t surprising that GBS is successful. On average, about 65% of excess weight is lost after one year. Weight loss typically plateaus after one to two years to an average of between 50 to 75 percent of excess weight. 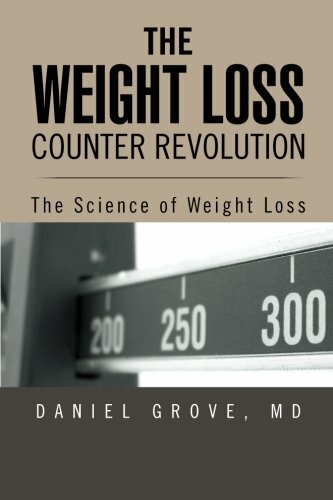 Sustained weight loss is seen for up to 16 years. The best part of the outcomes are that most of the diseases associated with obesity, including diabetes, sleep apnea, high blood pressure, and abnormal cholesterol go away after GBS. This is the main impetus for justifying the risk of the procedure. Severe bleeding inside the abdomen or at the incision sites. Wound infections in 10-15% of open procedures and 3-4% of laparoscopic procedures. Leaks inside the abdomen in up to six percent of patients. The rates of leaking from the sites where the small intestines are reconnected in GBS is 1.5 to 6 percent, but has been reported as high as 35 percent when a surgery has to be redone. If not diagnosed in a timely fashion, as many as 15 percent of these patients die. Blood clots to the lungs (aka pulmonary embolism) are the most common cause of death in the few days after weight-loss surgery and are responsible for up to half of the deaths. Respiratory failure accounts for 11.3 percent of the deaths that occur in the early period after surgery. 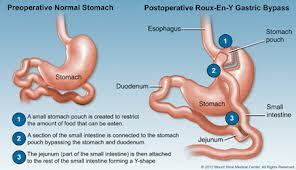 Extreme stretching of the bypassed stomach pouch is a potentially lethal complication of gastric bypass surgery. The leftover stomach that is bypassed by the surgery is a blind pouch and may become distended if there is poor movement of the small intestine or if there is an obstruction. Injury to the nerves of the stomach can decrease movement of the stomach causing progressive distension that can ultimately lead to rupture and spillage of stomach contents into the abdomen with terrible consequences. Scarring at the site where the small intestine segments are reconnected can lead to a narrowing and partial obstruction of the bowels. This has been seen in 6-20 percent of patients who have undergone GBS. Metabolic and nutritional abnormalities are common in severely obese patients before surgery. This seems odd, but the reality is that the diet of the obese generally leads to deficiencies in vitamins, minerals, and protein. Decreased exercise leads to decreased muscle mass and bone strength. These problems are all exacerbated following weight loss surgery if diet prescriptions are not strictly followed. The altered anatomy reduces absorption of various nutrients, particularly iron, calcium, vitamin B12, thiamine and folate. The end result is that patients, in spite of being very overweight, are significantly malnourished with respect to essential nutrients. They can have severely decreased muscle mass, which will impact metabolic rates and decrease exercise tolerance. Not only are you taking on the significant risk of one of the many complications of weight loss surgery, the procedure is by no means a guarantee of weight loss. It is possible to “trick” the surgery. Even though the surgery essentially shrink the stomach cavity size, it is easy to eat high calorie foods that do not significantly distend the stomach (e.g. milkshakes). You could also endure the dumping symptoms and still take in the calories. Further, the small stomach pouch will stretch over time if people aren’t compliant with their diet. This is a common problem. It has been shown that significant late weight regain occurs in up to 20 percent of patients usually due to patients not complying with dietary recommendations. So you can see that these surgeries are not to be taken lightly. They should really only be done when the complications of the obesity create a risk to life that is greater than the risk of complications from the surgery and only after a serious and intense effort has been made to lose weight without surgery. The bottom line is that surgery for weight loss is not a quick and easy fix to solve problems with weight. No matter what procedure is done, diet and exercise are still required for prolonged successful results. In fact, many weight loss centers require a serious attempt at non-surgical weight loss along with psychological evaluation before they’ll even consider you for the surgery. You must remember that there is no magic to the surgery either. All these procedures do is alter your anatomy and physiology in a way that creates severe discomfort and malabsorption from eating the way you did to get overweight. The procedures are there to make it easier to follow diet and exercise regimens. They are just extreme ways to alter the ‘energy in’ side of the energy equation that you learned about earlier. The exact same results can be had with a bit of knowledge, patience, and hard work. After reading this book, you’ll have the knowledge; the rest is up to you. Kellum J, Kuemmerle J, O’Dorisio T, et al. Gastrointestinal hormone responses to meals before and after gastric bypass and vertical banded gastroplasty. Ann Surg 1990;211:763. Brolin R, LaMarca L, Kenler H, COdy R. Malabsorptive gastric bypass in patients with superobesity. J Gastrointest Surg 2002;6:195. Tritos N, Mun E, Bertkau A, Grayson R, Maratos-Filer E, Goldine A. Serum ghrelin levels in response to glucose load in obese subjects post-gastric bypass surgery. Obes Res 2003;11:919. Cummings D, Weigle D, Frayo R, et al. Plasma ghrelin levels after diet-induced weight loss or gastric bypass surgery. New England Journal of Medicine 2002;346:1623. Korner J, Bessler M, Cirilo L, et al. Effects of Roux-en-Y gastric bypass surgery on fasting and postprandial concentrations of plasma ghrelin, peptide YY, and insulin. J Clin Endocrinol Metab 2005;90:359. Guedea G, Amo DAd, Solanas J, et al. Results of biliopancreatic diversion after five years. Obes Surg 2004;14:766. MacLean L, Rhode B, Sampalis J, Forse R. Results of the surgical treatment of obesity. Am J Surg 1993;165:766. Mun E, Blackburn G, Mathews J. Current status of medical and surgical therapy for obesity. Gastroenterology 2001;120:669. 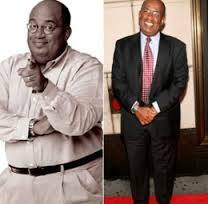 Zingmond D, McGory M, Ko C. Hospitalization before and after gastric bypass surgery. JAMA 2005;294:1918. Saunders J, Ballantyne G, Belsley S, et al. One-year readmission rates at a high volume bariatric surgery center: laparoscopic adjustable gastric banding, laparoscopic gastric bypass, and vertical banded gastroplasty-Roux-en-Y gastric bypass Obes Surg 2008;18:1233. Nguyen N, Goldman C, Rosenquist C, et al. Laparoscopic versus open gastric bypass: a randomized study of outcomes, quality of life, and costs. Ann Surg 2001;234:279. Schauer P, Ikramuddin S, Gourash W, Ramanathan R, Luketich J. Outcomes after laparoscopic Roux-en-Y gastric bypass for morbid obesity. Ann Surg 2000;232:515. Lim R, Blackburn G, Jones D. Benchmarking best practices in weight loss surgery Curr Probl Surg 2010;47:79. Schneider B, Villegas L, Blackburn G, Mun E, Critchlow J, Jones D. Laparoscopic gastric bypass surgery: outcomes. J Laparoendosc Adv Surg Tech 2003;13:247. Gonzales R, Murr M. Anastomotic leaks following gastric bypass surgery. In: Jones D, Rosenthal R, eds. Weight Loss Surgery: A Multidisciplinary Approach: Matrix Medical Communications; 2008:369.141. Melinek J, Livingston E, Cortina G, Fishbein M. Autopsy findings following gastric bypass surgery for morbid obesity Arch Pathol Lab Med 2002;126:1091. Morino M, Toppino M, Forestieri P, Angrisani L, Allaix M, Scopinaro N. Mortality after bariatric surgery: analysis of 13,871 morbidly obese patients from a national registry. Ann Surg 2007;246:1002. Lee S, Carmody B, Wolfe L, et al. Effect of location and speed of diagnosis on anastomotic leak outcomes in 3828 gastric bypass cases. J Gastrointest Surg 2007;11:708. Papasavas P, Yeaney W, Caushaj P, Keenan R, Landreneau R, Gagne D. Perforation in the bypassed stomach following laparoscopic Roux-en-Y gastric bypass. Obes Surg 2003;13:797. Schneider B, Villegas L, Blackburn G, Mun E, Critchlow J, Jones D. Laparoscopic gastric bypass surgery: outcomes. A. 2003;13(4):247. J Laparoendosc Adv Surg Tech 2003;13:247.